George R.R. 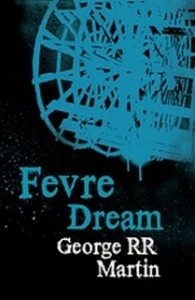 Martin's second novel is “Fevre Dream”, a horror novel set in 19th Century America. The main character is Abner Marsh, a veteran captain of the huge steamboats that travelled the Mississippi and its tributaries. Down on his luck after a series of disasters, he seizes on a business opportunity offered by Joshua York, a mysterious European gentleman, who offers to build with Marsh the finest ship on the Mississippi. The ship is duly built, but as the voyage commences Marsh becomes increasingly puzzled by York's behaviour – although he seems quite friendly, he only appears at night and avoids sunlight, and he makes frequent unscheduled stops at locations where brutal murders have recently occurred. “Fevre Dream” is an effective horror novel, superbly written with a suspenseful atmosphere. Martin presents an intriguing and original take on vampire mythology and builds an excellent story around it. The background detail is another notable feature, the author seems to have done plenty of research on the era and he manages to convey the majesty of the great steamboats. There's also a good amount of commentary on the social issues of the time, as a voyage into decadent New Orleans makes Marsh, despite his conservative instincts, increasingly conscious of the inhumanity of slavery. Martin's novels are noted for their surprises and this no exception – there are a number of interesting plot twists and he is very good at eliciting sympathy for a character who could easily have been the villain of the story. The idea of a vampire trying to avoid preying on humans may admittedly have become a bit cliched in the three decades since this book was originally published (although it would probably have seemed original back then), but Joshua does convince as a fully realised character, imperfect but also capable of being heroic. A more conventional vampire also provides a more traditional, and chillingly effective, antagonist. Abner Marsh is also a compelling character, he is an unlikely hero - a man with few friends, obsessed with his steamboat company almost to the extent of ignoring most human interaction he isn't initially particularly likeable but he does have some compelling character development as he is forced to confront both the inhumanity of the vampires who oppose Joshua and the inhumanity of his country's treatment of slaves. Martin's world-building as he portrays the world of mid-19th Century America is as detailed and evocative as his world-building of his other Fantasy and Science Fiction works. It is something of an achievement that the way of life aboard the Mississippi steamboats manages to remain an interesting part of the novel despite the obvious distractions caused by the presence of vampires in the story. The plot is consistently entertaining throughout the novel and it comes to a satisfying conclusion, with a surprisingly touching epilogue. Admittedly, the initial premise with Joshua funding Marsh to construct the steamboat of his dreams does seem slightly contrived and unlikely, but since this does lead to a very entertaining book this is only a minor flaw. In summary, “Fevre Dream” is the best piece of Martin's early pre-"A Song of Ice and Fire" work. It is very well written and manages to present what at the time would have been a fresh approach to a frequently clichéd genre and it should probably be ranked amongst the best vampire novels and manages to be a fine work of historical fantasy at the same time.